Join me and experience life in KL (Kuala Lumpur) after Five. This private experience will take you to see the hustle and bustle of KL life when office closes at five and KLites fights their way back home to their families to settle down for the day. We will use public transportation/walk to our destination and take a ride to the top of a Helipad (37 floors) to watch the sunset (weather permitting!) 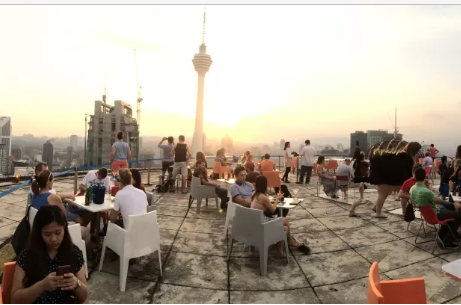 over the city scape of Kuala Lumpur and watch the city light up after dark from a vantage point high above the city.with a beer in our hands. Then, we will take a stroll to the Petronas Twin Towers to see a light and sound performance at the Symphony Lakes followed by a most popular Malaysian dinner. We will then have an experience riding our local subway to emerge at the night market of Chinatown before heading back to your hotel. Meet and Greet at Pasar Seni LRT Station or at your Hotel in the city. Arrive at our special venue of an Office Tower Helipad turned Lounge after Five. As the sky darkens, watch the city KL light up especially the KL Tower and the Petronas Twin Tower. Arrive at the sparkling Petronas Twin Towers - the icon of KL. Enjoy the light and music display of the Petronas Symphony Fountains.